During the sermon ceremony at Tain Taung Buddhist University in the city of Taung Gyii organized by Dhamma Yaung Sin group on the night of November 28th, the pamphlet with the title “Daw Aung San Su Kyi, NLD and our future” written by A Nya Ta Ra Bhikkhu (Master in Dhamma) were disturbed to the devotees. Regarding these pamphlets, Taung Gyi NLD wrote a complaint letter to Township Election commission. 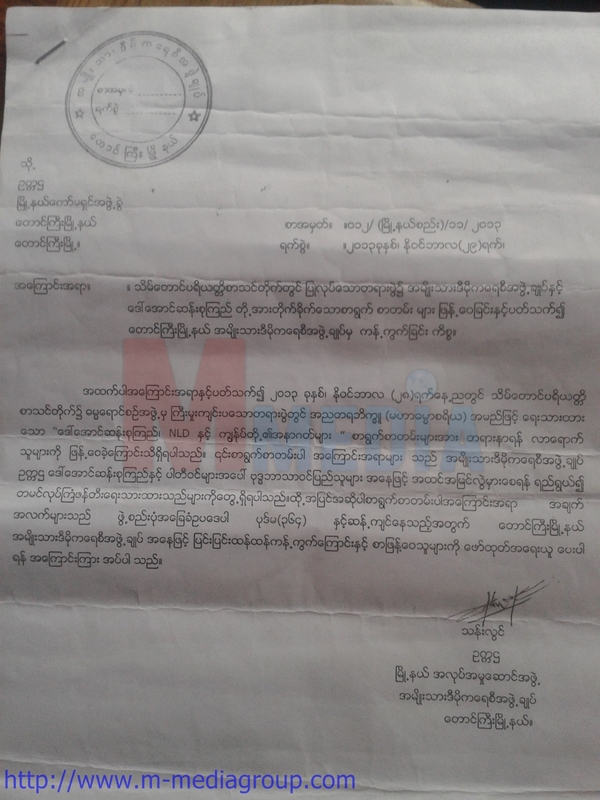 In addition to the fact that the information contained in these documents is mere instigations to create misunderstanding of local Buddhist population towards NLD, it is clearly against Constitutional Act 364. In the letter No. 002/(Township)/11/2013 addressed to Township Election Commission, Taung Gyi NLD strongly condemned this act of instigation and urged the authorities to find out instigators and take appropriate action. The following is the pamphlet “Daw Aung San Su Kyi, NLD and our future” written by A Nya Ta Ra Bhikkhu (Master in Dhamma). NLD leader Daw Aung San Su Kyi has expressed her wish to become the President in 2015. In the previous situation, everyone is willing her to be the next president. Monks also included among her supporters. But everything has changed now. As a monk, I can’t tell whether she will become President or not. However, I want her and NLD to know what monks are thinking about. What monks are thinking now is what will happen to the monks and Buddhism after Daw Aung San Su Kyi receiving power in 2015. Actually, it has been not long since we started thinking about it. Before, monks are the strong supporters of Daw Aung San Su Kyi and NLD. Monks even gave their lives for Daw Aung San Su Kyi and NLD. Saffron Revolution is the great example for that. But now monks and NLD headed by Daw Aung San Su Kyi are walking in totally different direction. Who did it? Frankly speaking all happened because of Daw Aung San Su Kyi. Since Sayadaw U Bassita Biwintha (Wirathu) pointed out Khout Down (Peasant= symbol of NLD) became Mot Down (Pro-Muslim), NLD has begun to attack him as their big enemy instead of trying to counter the influence of Islam and Muslim on their party. After that, such attack has gone further to all Buddhist monks and NLD members are attacking monks as if they are not Buddhists. So all the monks both inside and outside of the country participated in this conflict of monks and NLD. The prime factor which escalates this conflict is the issue of “Safeguarding the Identity” Law. After the media mentioned that U Wirathu will be proposing the law in Hmaw Bi Assembly of Buddhist Monks, Daw Zi Kwat, Daw Zin Mar Aung and Daw Aung San Su Kyi strongly opposed this law when media asked the opinion of woman on this issue. They said, “It violates Human Right.” Then, online debate on this issue intensified. The attack of Khun Dee Wan @ May Zin Aye from NLD on Buddhism was intolerable to Buddhists. At the same time, the photo of Daw Aung San Su Kyi and May Zin Aye spread online and monks believed that Daw Aung San Su Kyi also agrees with NLD regarding its attack on Buddhism and Buddhist monks. Since then, monks have been thinking of the future of Buddhism. We want to ask Daw Aung San Su Kyi how can she guarantee (the safety of) Buddhism and monks if she won 2015 election. We have to ask this question because monks assume that Daw Aung San Su Kyi never speak out to protect Buddhism and monks instead she told many times indirectly to protect Islam and Muslims. This assumption became solid when Time Magazine mentioned about Buddhist monks including U Wirathu and Myanmar Buddhism in the cover page with the title “The Face of Buddhist Terror”. While mainstream Myanmar media including President Office condemn Time Magazine, so called Buddhist Daw Aung San Su Kyi did not utter a single word. Furthermore, NLD members spoke against anti-Time magazine campaign. 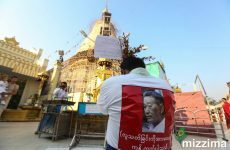 We believe that failure to protect Buddhism by Daw Aung San Su Kyi and NLD is because of Islamic influence on the party. It is said in the public, “Frankly speaking, even when they don’t get power yet, they want to defy monks. 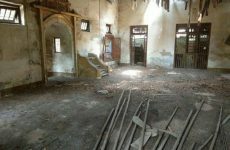 If they get power, they may even slaughter monks.” Monks feel that Daw Aung San Su Kyi and NLD neglect monks and Buddhism. Moreover, Daw Aung San Su Kyi has contact with OIC. President U Thein Sein don’t allowed to open OIC office in Myanmar. However, it is very sure that Daw Aung San Su Kyi will allow them to have their Myanmar office in 2015. In OIC’s final communique of the OIC contact Group on Myanmar Muslim Rohingya Minory, item (g) stated “Muslim opinion leaders and NGOs should convey their views to their counterparts in Myanmar, first and foremost to Ms. Aung San Suu Kyi, chairperson of the National League for Democracy.” It clearly shows the connection between OIC and Daw Aung San Su Kyi. OIC is absolutely not for Burmese, it is just for Bangalis and Islam. She also said that 1982 citizenship law should be amended according to international standard. Although Banglis who she is protecting are not able to live with international standard, she will amend citizenship law in accordance with international standard. That amendment will not be for Buddhism nor Burmese people. It is just for Bangalis and Islam. Even they don’t get power yet, they tried to amend it. If she gets power, she will surely amend it. Not only Muslims take important positions in NLD party, they also have influence over other members. Now there are 3 Muslim MPs. If NLD won election, there will be 30 Muslim MPs. If so, Muslims will become Ministers in the government and they will give trouble to Buddhism and Monks legally and illegally with the support of Daw Aung San Su Kyi. NLD and Daw Aung San Su Kyi definitely knew that these assumptions are not groundless. If monks and Buddhist believes that Daw Aung San Su Kyi and NLD is the danger for Buddhism and monks, not only monks but also the public will try their best to prevent Daw Aung San Su Kyi and NLD from winning the election. Because President of Myanmar must be the protector of Buddhism in the other words he or she must guarantee the protection of Race and Religion. If he or she can’t, they should not be the president of Myanmar. If Daw Aung San Su Kyi became the president, what will happen to monks and Buddhism? Bright Future? Or hopeless? Monks and Buddhist public want this country to be a Buddhist Democratic country. However, our democratic leader favors Islam over Buddhism. And the public prefers Buddhist Totalitarian over Islamic Democracy. Now monks and Buddhist public are between the devil and the deep blue sea. Don’t be upset. The decision depends upon the Buddhist public. Monks can’t choose directly. But the public has to choose their president. So, it is so important the public don’t make wrong decision. If they did, not only the general public but also monks will suffer its bad consequences. So, the public must know that people’s choice is so important. I would like to request you all to choose the one who can guarantee the safely of monks and Buddhism, in other words, Race and Religion, as President of Myanmar. Future of Buddhist monks and Buddhism will not be luminous. A Nya Ta Ra Bhikkhu (Master in Dhamma).